Review Posted October 8, 2008. Dial Books, New York, 2007. 371 pages. In Seeing Redd, the sequel to The Looking Glass Wars, Queen Alyss's Aunt Redd is again plotting to take over the queendom of Wonderland. Now she's in our world gathering a sinister army to join her. Next door to Wonderland, Alyss's neighbor King Arch has plots of his own. Meanwhile, Hatter Madigan is finding out what happened to his family while he was gone. This second book has a darker feel, with lots of time taken up showing the evil of those dedicated to Black Imagination. There's also lots of detail in the fighting and weaponry. This trilogy (I believe it will be) will make an exciting movie some day with lots of special effects, but I had trouble visualizing the detailed weaponry, and wasn't terribly interested in that part. 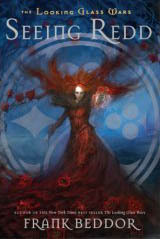 I am now quite interested in Alyss, so I will definitely want to read the third book when it comes out. I hope she gets a time of rest at the end!